BOOK YOUR LAKE KISSIMMEE TRIP NOW! Lake Kissimmee covers some 38,000 acres from the mouth of the Kissimmee river on the north end to the exit of the river near US Highway 60 on the south end. Specializing in largemouth bass, bluegill, black crappie and shellcracker. Part of the Kissimmee Chain of lakes. Expansive stands of native aquatic grasses at Philadelphia Point, North Cove and Brahma Island provide anglers with cover to flip plastic baits or slow-troll golden shiners for spawning bass during the winter and spring. Rattling crankbaits, soft jerkbaits and Texas or Carolina-rigged plastic worms fished in open-water or along edges of vegetation are productive during summer and fall. Fly fishermen have good success wade fishing along the miles of shoreline on Lake Kissimmee. 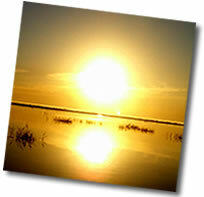 Lake Kissimmee is rich with wildlife, including bald eagles, white tailed deer, bobcats, turkeys and big alligators. With Lake Kissimmee being located where it is, it's consider Central Florida Fishing and with our guide service, you will cam enjoy all of Central Florida and Kissimmee fishing at its best. We are a complete Florida fishing guide service, located near Disney, Epcot, Universal Studio's, Islands of Adventure, Sea World, and other Central Florida attractions. We fish freshwater lakes while fishing, especially largemouth bass, we suggest Lakes Kissimmee and Tohopekaliga. Our licensed guides offer expert local knowledge, fully equipped boats, and exceptional service. Central Florida is known for it's lite winters, fine fishing, great golf courses, and fun family activities. Let Bass Online charter your next fishing trip, which will help you to make your next fishing vacation a memorable one! To find out more about our guide service, please browse our web site. We also offer Central Florida bass fishing reports. There are bass photos as well as pictures of other great catches that were made right here in the Central Florida area on Lake Kissimmee chain. Lake Kissimmee is world famous for it's catches of big largemouth bass, yet the fishing pressure is fairly light due to the expanse of vegetation, and the many places for bass to hide out and ambush baitfish. It is entirely possible for a bass to live to a ripe old age without many encounters with anglers, since there are places which are impossible to reach with any conventional boat. Lake Kissimmee was drawn down in 1995-1996. Part of the process in drawing down the lake included the creation of 24 miles of new shoreline, where the muck was scraped off the bottom of the lake to reveal clean sand underneath. These areas are now prime bass spawning habitat. The new bass population became evident in 1998 and the effects of the draw-down will continue to be felt over the next 15 years. An increasing awareness of the benefits of catch and release fishing is having an impact on the big bass population as well. the attack. Wild shiners are much preferred, since they are hardy and more active than hatchery raised shiners during curtain times of the year. Central Florida bass go for shiners in all sizes, but bigger bass go for a shiner in the 4 to 6 inch long range. Shiners over 6 inches can be used, and it seems there's no upper limit on shiner size, since a 2 lb. bass might well decide to eat a shiner 7 inches long. The moon phase and time of the year really dictates the feeding habits of the bass! In warmer weather, after spawning season, a somewhat smaller shiner like a hatchery shiner may be better, as bass are then feeding on shad and small shiners. You can depend on us to recommend the correct size shiner for the present condition. Our guides go to great length to get the proper size shiner when fishing Lake Kissimmee. Shiners can be fished several ways, including with a bobber, free lined in heavy cover, or with a small bobber tied to the line as a "strike indicator". Shiners will often become agitated and even jump out of the water when a bass is stalking them, it sometimes emulated a top water lure strike. The bobber acts a strike indicator and has less resistance to the vegetation then you would think. With the addition of a bobber stop, it can slide up the line as the bass runs into the cover with the shiner. Methods of attaching hooks to the shiner are either through the lips and out one nostril, or in the back, just below the tail end of the dorsal fin. Both methods have their drawbacks. The shiner hooked through the back are able to swim naturally, but are commonly pulled backwards when reeled in which leads to a much shorter life span. Repeated reeling and casting results in a sluggish or dead shiner. Hooking in the lips impedes the shiner's swimming ability a bit, but allows him to be reeled in more times before dying. A lot of bass can be taken on a variety of artificial lures in Kissimmee, based on the water color, temperature, wind, cover, and time of year. Plastic worms are a good bet always, as are rattle traps, buzz baits, weedless spoons, spinner baits and frog baits. Numbers of bass are taken regularly on top waters and shallow crank baits. In the heat of the day flipping and pitching the weed lines can land you a trophy bass. Know when it comes to artificial lure fishing on lake Kissimmee, there are no other guides services with the amount of Professional tournament guides as BassOnline.com has, so to learn the latest techniques and have a great day on the water check our fishing guides out. Panfish, Crappie catches at Kissimmee/Hatchineha can be awesome! A ultralight, and 4 lb test with a Beetle Spin, or live minnows and a pole can wear you and the fish out. Most times there's not much problem to get 30 or more fish in few short hours. Casting Beetle Spins at a Hydrilla bed can produce Bluegills, Shellcrackers, and buckets of Speckled Perch (crappies), and those guys will give a 4lb test outfit a real fight.